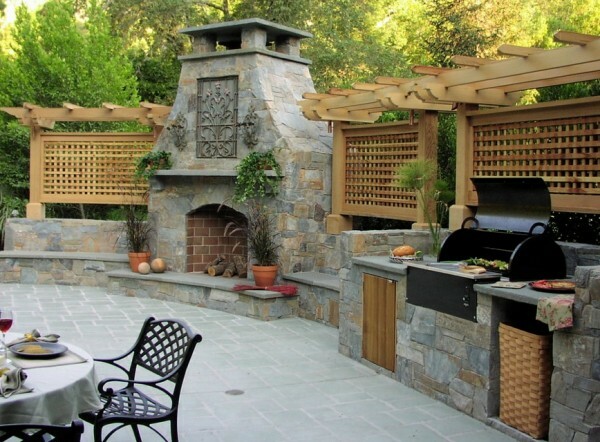 Idaho’s winter weather is a good time to re-design your outdoor living space on paper. Have you heard the old saying, “good fences make good neighbors”? Every family could use a little outdoor privacy to dine, to play and to be refreshed by nature in their own backyard. In addition to traditional fences, you have multiple options to choose from when you consider screening poor views out and privacy into your landscape or patio. FarWest Landscape designs and builds all kinds of privacy screens for our clients in Boise, Eagle and Meridian. Here are some fun options to think about this cold month of January. Traditionally, rock walls have been one of two types – mortared rocks, or dry stacked. Both versions are still quite popular and between the two, fit a variety of design styles. Gabion walls have been used for centuries. In fact, the term“gabion” is French, and dates to the mid 1600’s . Gabion walls are being used in Idaho residential landscapes now. An assortment of metal gauges and finishes can be used for the metal cages. There are many local sources for rocks that can be used to fill your privacy screen. Sizes and colors of rocks can really define your gabion wall or privacy screen. 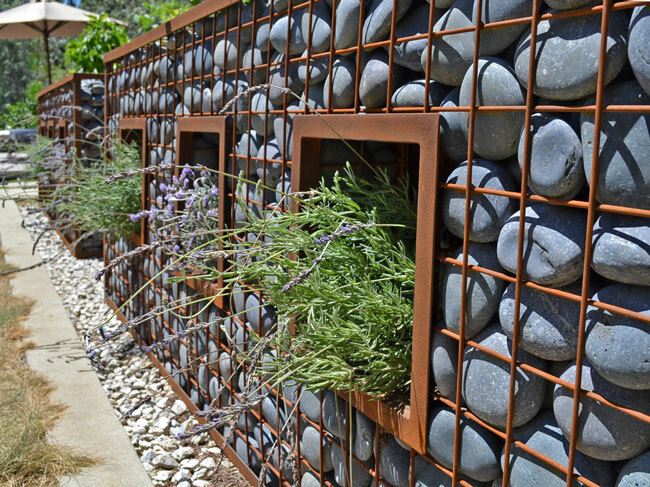 We love the hardy lavender plants growing in the windows in this gabion wall. many ways, and with many different garden plants. The pockets in the example on the right contain an entire herb garden. 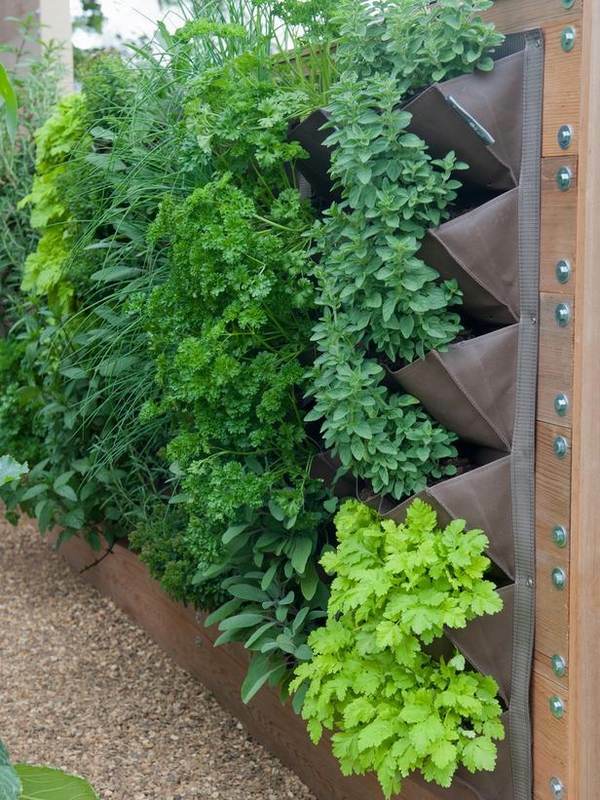 What a terrific way to screen your patio, enjoy the natural aromas, and have seasonings handy for the grill! The pockets hold soil and plants in, yet allow for drainage. You could plant shade or sun loving perennials for a different look entirely. A drip line irrigation system for watering could be installed, or you or your kids might enjoy the relaxing act of hand watering with the gentle spray of a hose. Does your landscape need blocks of screening in certain areas? The versatile screening system below is a great way to block particular areas completely with the corrugated metal. 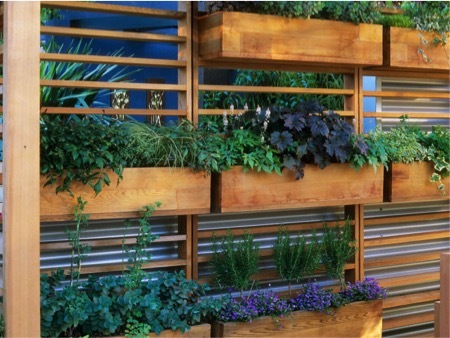 You can lightly screen with the planter boxes, and allow airflow through some spaces with horizontal wood slats. This combination screen is perfect for a front entry, a bedroom patio or even as a soft screen in an area of your landscape that needs vertical interest. Notice the way the more open areas of the system combined with the living plants (herbs & perennials) lend a fresh feel to the space. sets the dining area apart, creating a cohesive and well-designed private space without screaming “brick wall”. The chimney of this gorgeous fireplace, in combination with the lattice screens against a plant filled background creates a wonderfully cozy place to host intimate gatherings without neighbors peering in. What a great setting to enjoy the fire on cool evenings! Plan this month for your 2018 yard make-over with FarWest Landscape’s design team and be ready to enjoy your new yard this summer. We can help you create the privacy screen of your dreams. Call FarWest & let’s get your landscape project completed: 208-918-0967.